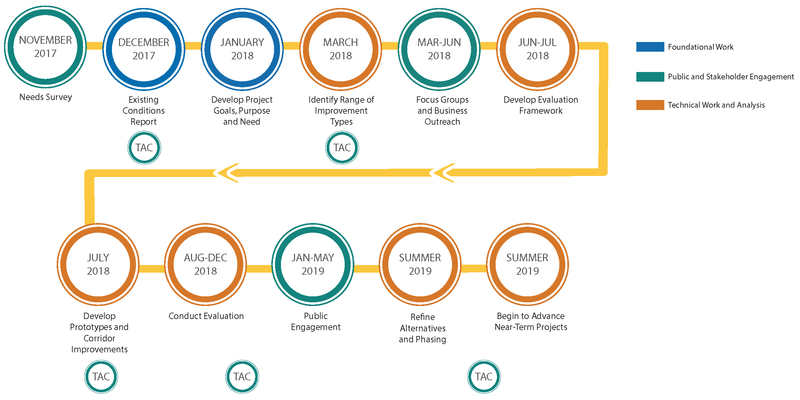 The San Pablo Avenue Corridor Project seeks to develop a long-term vision and near-term improvements for San Pablo Avenue that will allow it to function better and be safer for people who walk, bike, drive and take the bus. To provide input, go to the "Provide Your Input" tab on this page for the SURVEY and a listing of workshops. Serves as a reliever route for freeway traffic during incidents on I-80. Jurisdictions are concentrating growth along the corridor, with several higher-density, mixed-use developments recently completed and numerous others under consideration. To better serve existing users and accommodate growth from new housing and jobs, the corridor must be able to effectively carry more people through increased efficiency and improved travel choices. The corridor has limited right-of-way and competing demands, which must be brought together in a comprehensive, systematic way to achieve safety, quality, and convenience for all users and all modes. Transit service in this corridor suffers delays and poor on-time performance due to moderate to severe traffic congestion on several key segments, which undermines the attractiveness of transit as a travel choice for many users. The corridor experiences high rates of collisions, affecting the safety of all users. Alameda CTC is currently developing a long term vision for the corridor and identifying short-term projects to improve the safety and experience of all users. The project spans two counties; the Contra Costa County Transportation Authority and the West Contra Costa Transportation Advisory Committee have contributed funding to the initial phase of analysis. It is a multi-year effort that includes seven cities along the 12-mile-long corridor (Oakland, Emeryville, Berkeley, Albany, El Cerrito, Richmond and San Pablo), Caltrans, and AC Transit. The project is taking a detailed look at what can fit within the existing roadway and what the trade-offs are between different types of improvements. It is looking to support current and future businesses and residents along the corridor to ensure we keep up with the number of people who will live in the East Bay in the coming years. For questions on the project, email sanpabloave@alamedactc.org. The project is currently at the conceptual design stage, exploring what improvements can fit within the existing roadway. We have developed different concepts for how the space on San Pablo Avenue could be used differently in the future and want to hear from you. Please complete this quick SURVEY to provide your input on trade-offs between different types of improvements for San Pablo Avenue. The survey will close May 5, 2019. Wednesday, April 24, 2019, 6:30-8:00 p.m.
Tuesday, May 14, 2019, 7:00-8:15 p.m.
Thursday, May 23, 2019, 6:30-8:00 p.m.